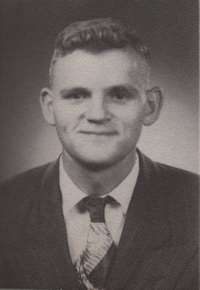 Obituary – Estes, Gerald Lee « Perry High School Alumni Association, Inc.
Wrestling 54-57, F. F. A. 54-57, Baseball 55-57, Basketball 54-55. Gerald Lee Estes, 72, died on April 29, 2010 in Oklahoma City, Oklahoma. His funeral services will be at 2:00 p.m. on Monday, May 3, 2010 at the Strode Funeral Home Chapel in Stillwater, with Reverend Michael L. Chace officiating. Interment will follow at Sunset Memorial Gardens Cemetery. Strode Funeral Home is in charge of arrangements. He was born on December 7, 1937 to Walter J. and Ethel (Bishop) Estes. He married Loretta Sue Ham on November 19, 1967 in Stillwater, Oklahoma. He graduated from high school, then went to work at a Stillwater grocery store. Later Gerald worked at Ditch Witch in Perry. He enjoyed fishing, playing cards, and watching college football. He was preceded in death by parents, Walter and Ethel; brother, Bill Estes; and sister, Maxine Gramley, two nephews Richard and DeWayne Estes and one niece Audrey Bench. He is survived by his wife Sue; brother Roy and Margaret Estes; brother-in-law, Richard Fagan and wife Betty (Ham) Fagan; sister-in-law, Carolyn (Ham) Murray and several nieces and nephews. Memorial contributions may be made in his name to a charity of your choice.